Both chops and cut-downs are thought of as sacrilege for some within the more ‘conservative’ scootering circles. Now add to that a modern automatic engine and you could be committing one of the seven deadly sins! I am not one of the ‘do-gooders’ for whom chops and autos amount to heresy. 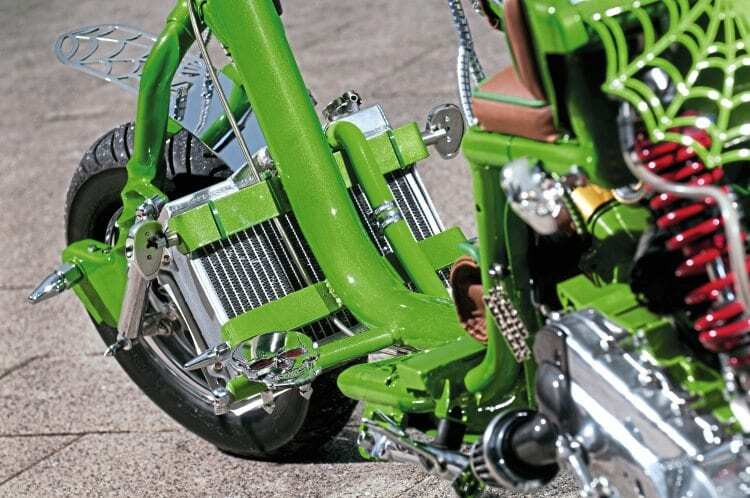 I have enjoyed riding both over the years and love to see any custom that has been thought out and gives something new and interesting – whether it be a controversial theme, one off parts, or just simply something that defies the status quo! 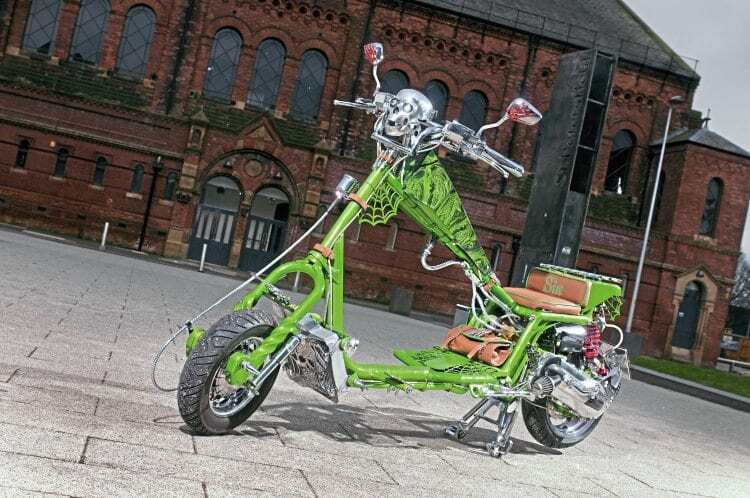 Michael Street’s auto chop definitely does that, based on the grafting of a Lambretta front tube and Gilera Runner engine cradle. 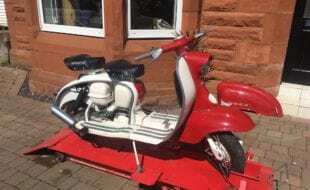 In all it has taken him, and his two mates Mark and Dids, nine months to create, starting with only a junked frame tube and written off Gilera (am I starting to win you over?). First the frame was jigged up so it would be a comfortable ride for Mr Street (who is, if anybody knows him, quite a unit! 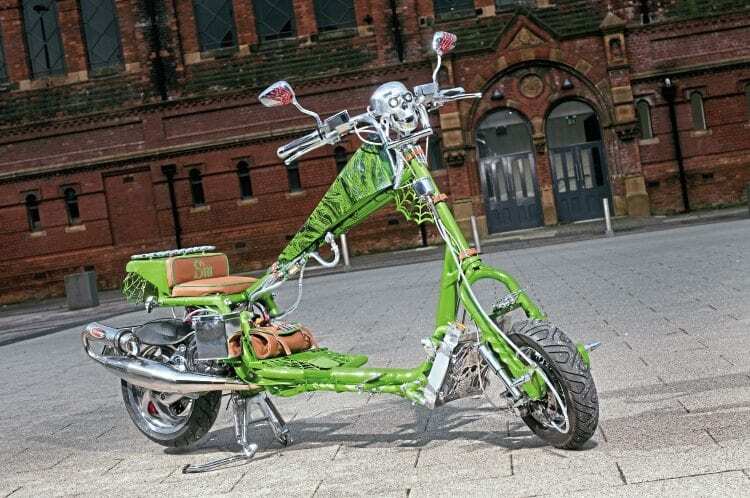 ), eight inches were put in the Lambretta frame and then the forks were lengthened by adding a further three inches of twisted bar. 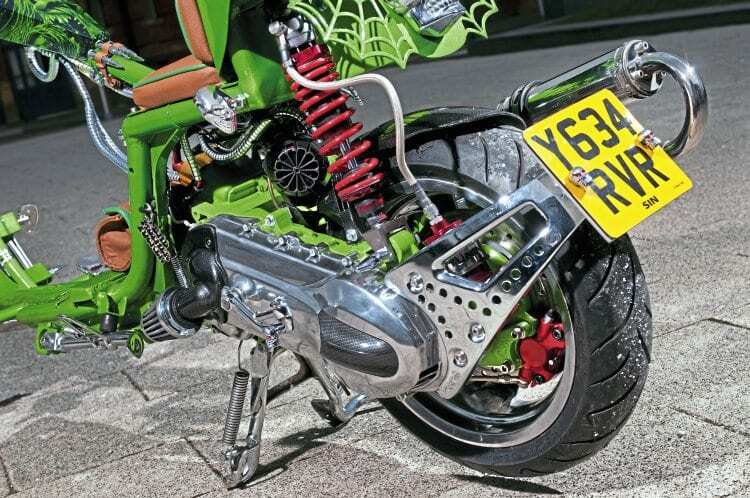 Once he was happy with the basic characteristics he then designed and built a one-off seat-unit/rear end out of steel tubing and this was smoothly welded onto the other components, as was a centre tank bar. Now although it obviously has a ‘modern’ engine the basic silhouette is very much the same as any ‘classic’ 80s chop! Anyhow once he was happy with the frame, other parts were fabricated to not only fit in but to give his creation character. An angular coffin petrol tank was sized to fit between handlebars and seat. Also laser cut metal webs were made for the rear unit, frame/cradle area and tank tube to not only give originality but also structural strength. 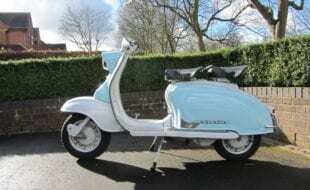 Various other fixtures and fittings were also welded on to accommodate required items such as foot-pegs, battery box and for a water-cooled engine a radiator and its pipe-work. This brings us nicely on to the power plant. 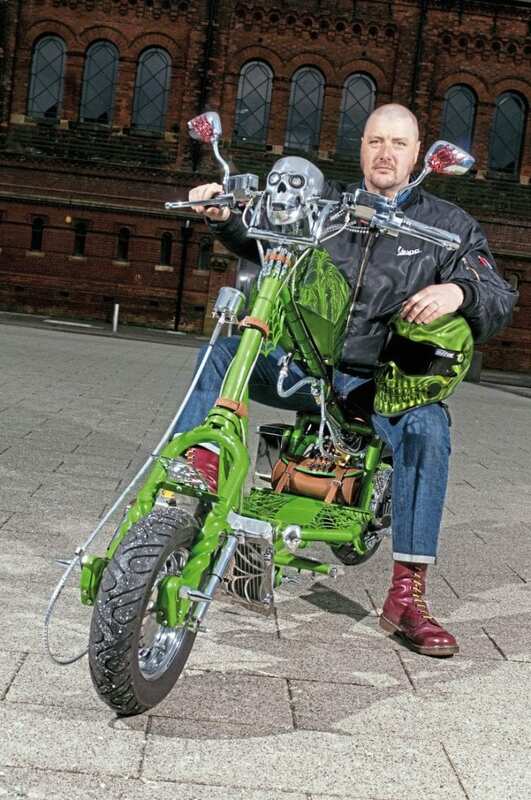 Michael is lucky enough to come from the same area as scooter racer John Woods. 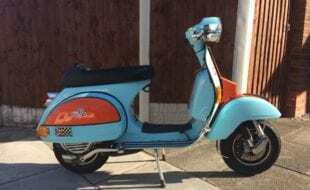 Known for his track exploits on both small-frame Vespas and modern autos John knows a thing or five about building a fast but reliable Gilera engine. First the original barrel, piston and head were upgraded for Malossi 172cc parts. This was then fitted onto a 54mm stoke race crank, taking the capacity up to 183cc! To cope with the extra bore/stroke a larger Dellorto cart fitted on a Malossi reed-block was jetted in, the gases exiting via a Scorpion exhaust pipe. Internally everything was beefed up with Malossi parts such as variator, belt, etc. 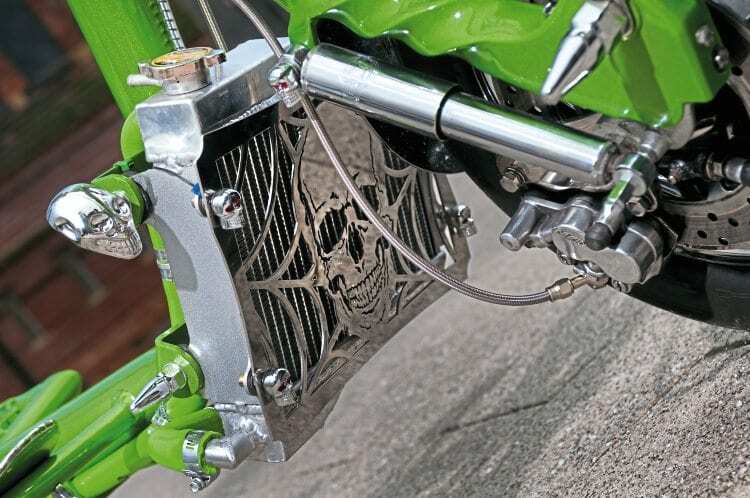 To keep it running cool an enlarged aluminium radiator from a race Yamaha RD350 is used. Once the engine was installed and all the pipes and cables checked for fitment it was dismantled for paint and ‘prettiness’. 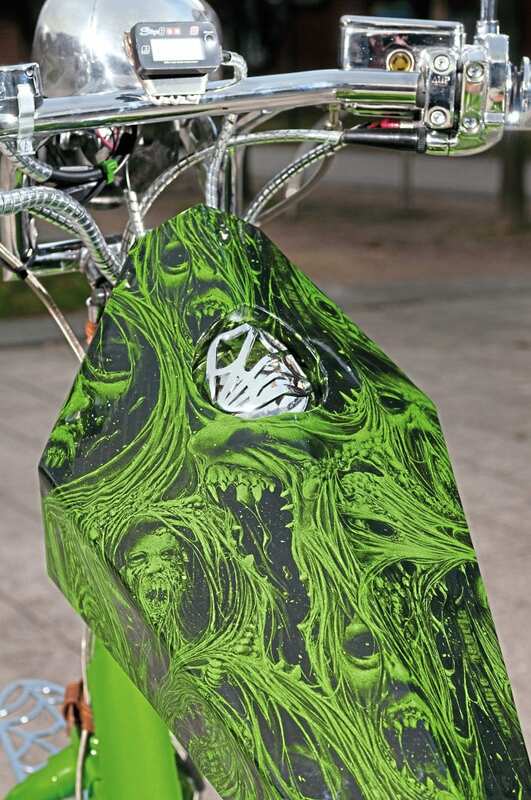 The tank was given a candy lime green base and then black horror murals added by Craig Foreshaw at Prestige CC. The frame and other parts got a matching durable powder coating by Coyote Coatings. Everything else was then either polished or plated by a local specialist. 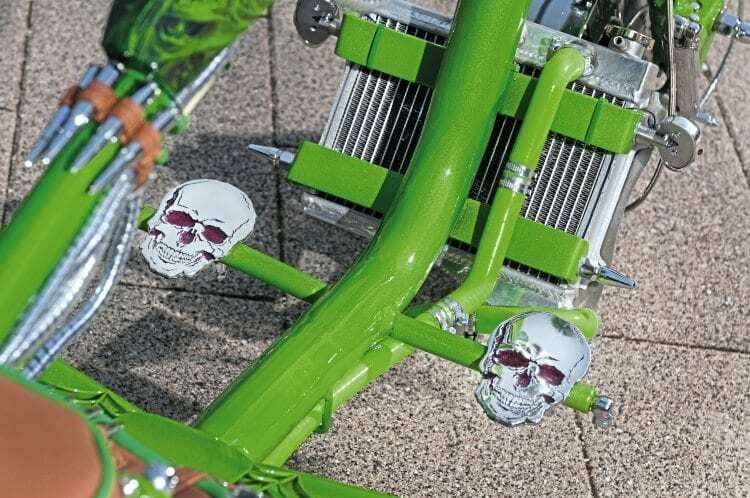 Other parts were laser cut such as the petrol cap and front mudguard, or bought off the shelf and adapted such as the light skulls, handlebars, etc. 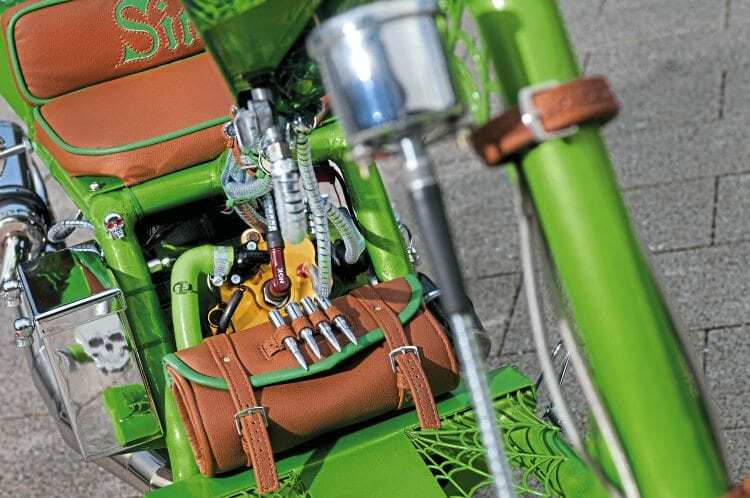 He also took inspiration from the motorcycle world matching a faux leather tool roll and cable ties to the embossed seat. In total Michael spent many hours and a not insignificant £5500 building his chop, and I for one am very impressed with the finished article. Not only does it tick all the required boxes, but gives some fresh ideas too. Scooter club & town: Nite Owls, Manchester. 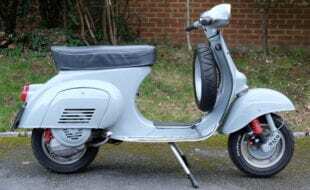 What was your first scooter: PX125, it was a rust bucket. First rally or event: Morecombe ’83. In a Transit van with my mates Sam Stubbs and Herby RIP. Favourite and worst rally/event: Favourite is Bridlington, worst Bognor. Funniest experience with a scooter: Going too fast round a corner and ending up in a bush. 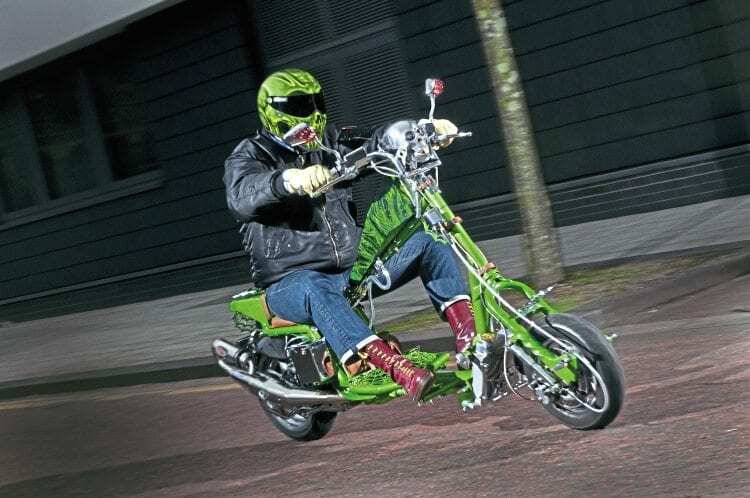 Furthest you’ve ever ridden on a scooter: IOW. What do you like/dislike about rallies/events: It’s like I have a big family, with the odd d***head! 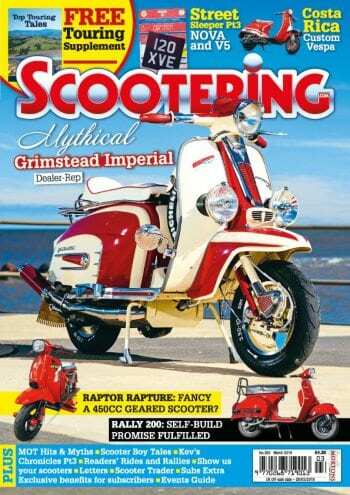 Favourite Scootering magazine features: The one my chopper is in, lol! 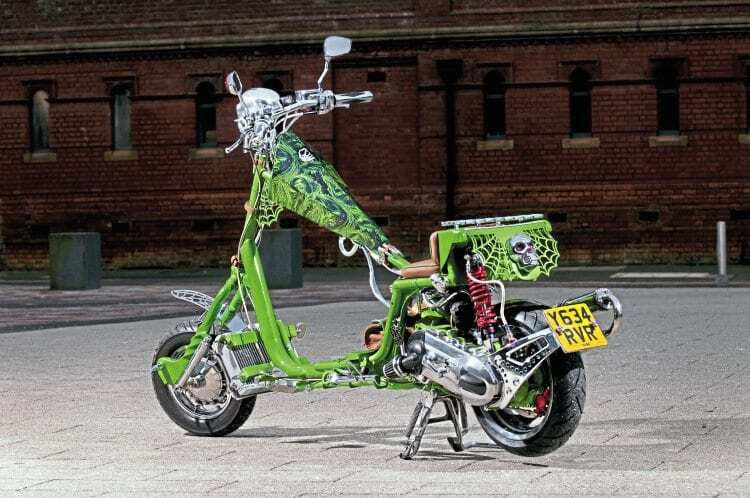 Favourite custom/featured scooter of all time: Fairground Attraction. 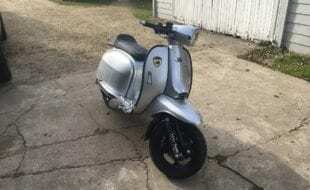 What would you like to see in Scootering that isn’t in it already: It is good as it is. 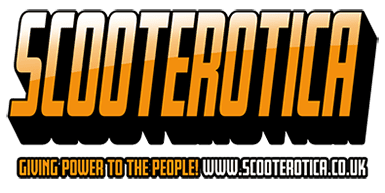 Who first inspired you in the scooter scene/or your first scooter hero: My dad was a rocker and told me if he ever saw me on one of them hairdryers he would **** me, lol. 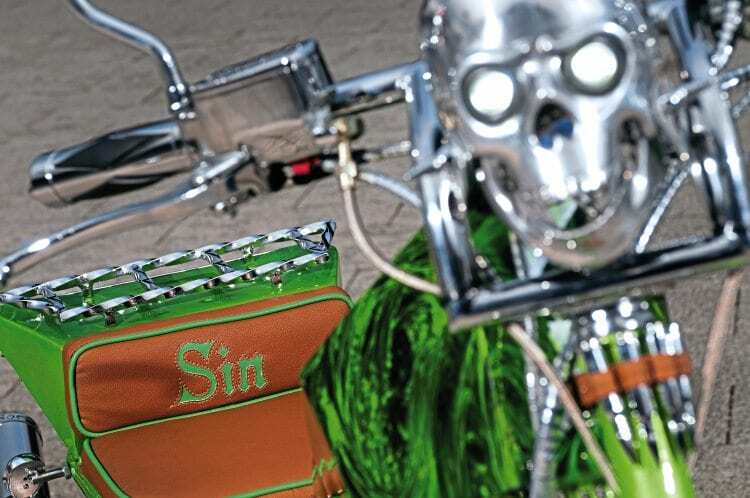 Name of scooter: Sin, because it’s a badass. Time to build: About nine months. 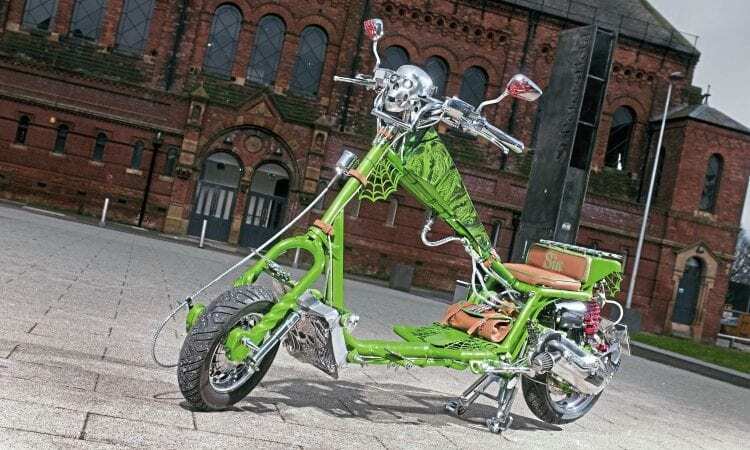 Any frame modifications: Extended forks and frame. Hand fabricated back end, seat and rear light. Ray O’Brian laser cut the webs. Original petrol tank. 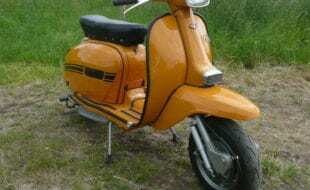 Engine: Gilera, Malossi 172cc, 54mm stoke crank. 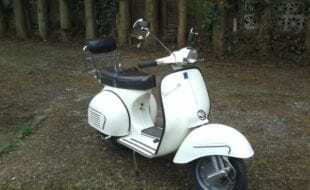 Dellorto carb, Scorpian exhaust, race rad. Top speed and cruising speed: About 80mph. Is the scooter reliable: Very reliable. Paintwork & murals: Craig Forshaw at Prestige Custom Coating Ltd.
Chrome & polishing: R&S Plating in Failsworth. Hardest part of the project: Time. Is there anyone you wish to thank: John Woods, Mark Peters, Dids, Ray O’Brian.